Follow the navigation links (left margin) for specific problems for each chapter's homework assignment. It is very important that the chapter reading and homework are done before coming to class. 1 Review Summer Assignment: Chapters 1-3 Conversions, Metric System, Atoms, Compounds, Naming and Formulas. Summer Assignment due 1st day of class. 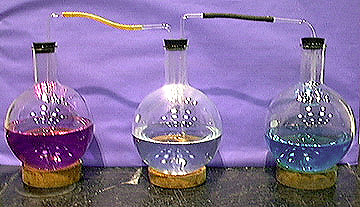 Determination of Boiling Points and Practicing Lab Technique and Reproducing results. EU 2B. Student Time: 2 hrs. Guided Inquiry with individual extension ID unknown based on B.P. millimole and redox balancing. EK 3.B.3 Exercises: 4.3, 4.5, 4.19, 4.21, 4.24, 4.34, 4.39, 4.51, 4.55, 4.61, 4.73, 4.87 Mass-Mass Stoichiometry Lab. Focus on reproducibility and error. EK 3.A.2 Guided inquiry: students must determine own error and possible explanations. Chapter 4 Solution Stoichiometry Test. 5 Chapter 5 cont. Visualizing concepts: 5.2, 5.4, 5.9. Exercises: 5.25, 5.27, 5.35, 5.41, 5.43, 5.51, 5.55, 5.61, 5.63, 5.69, 5.71a, 5.71b, 5.77, 5.83. Determination of a calorimeter constant. Electronic Structure of Atoms : atoms, electrons, quantum numbers, electron configurations. In 2017 Chapter 6 and 7 will probably be compressed to a single unit test. They are very inter-related. *Laboratories consist of a minimum of 90 minutes of work, by the students manipulating chemicals and/or lab equipment and generating their own data. Lectures will be supplemented by teacher demonstrations that may require note-taking or calculations by the students. Labs may need to be finished on your own time. Lab will be open at least 1 afternoon per week. For those interested in molecular modeling. Here is a link for some spectacular freeware/shareware courtesy of ACD Labs.